funny, i was admiring your lovely profile in this photo! oooh i just got a nikon d60 myself - what a wonderful birthday gift! and yes i know exactly what you mean about party outfits - im always scurrying to prepare everything because i take so much time deciding on what to wear! its usually the last thing i try on when people start arriving that i end up wearing, lol. Happy Birthday! I love that picture, too. It captures such a perfect moment. 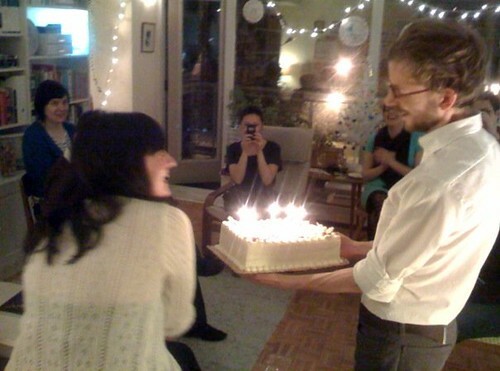 The cake looks beautiful and Geoff and you look so happy. :) I'm glad to hear your special night was wonderful. I love Christmas time visits, too. It was nice to see all my good friends. happy birthday sweetie! WOW a nikon d60!!! quarter slab vanilla buttercreme cake sounds freaking decadent! I wish I was there... with champagne! That sounds delicious and spectacular. :) Yum! Happy birthday! Thank you! I feel so lucky! The cake was decadent and so good! I think they were singing to me here, which was a funny moment, and there was plenty of prosecco flowing -- I couldn't have asked for a nicer party! Happy happy birthday! What a lovely, warm picture. this is a lovely photo! it looks so warm and everyone is so happy.. beautiful!